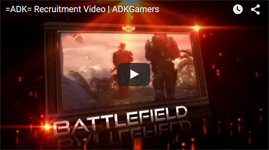 @ExplicitNuM5 Welcome to the ADK forums! Nice to see you are interested in our community. Look forward to seeing you around. @Cloudster Welcome to the ADK community forums! We are always happy to have new people join. Look forward to seeing you around. @Veles Welcome to the ADK community forums! I use to play a lot of Planetside as well. I have not been back recently but I have heard they made a ton of changes. Look forward to seeing you around teamspeak and forums. Welcome to ADK forums @Mimi! Welcome to the ADK forums @Fabianobnu. @SGCrazyman They are both back up now.